Published: Feb. 4, 2014 at 04:06 p.m. Updated: Feb. 28, 2014 at 07:49 p.m.
With the offseason officially under way, Around The League will examine what's next for all 32 teams. The series kicks off with the champion Seattle Seahawks. 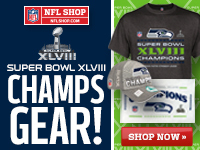 The Seahawks were the fourth-youngest Super Bowl champions in NFL history. For at least one more season, they can easily keep together their core group of players together with their energetic, intact coaching. Still, they are tight to the salary cap and have to prioritize who to cut, what free agents to sign and what veterans to reward with new long-term deals. Success will get expensive soon enough: Russell Wilson can get a new contract in 2015. » DE Michael Bennett: NFL Media Insider Ian Rapoport reported that the Seahawks will re-sign Bennett. He won't be cheap since he played like a premier pass rusher after signing a one-year deal in 2013. » WR Golden Tate: Retaining Tate will be a priority, Rapoport reported. Tate has shown flashes, but he never consistently lived up to his promise. » CB Walter Thurmond III: He's a great nickel back, but that might be a luxury the Seahawks can't afford. Other key free agents: K Steven Hauschka, QB Tarvaris Jackson, DT Clinton McDonald, DT Tony McDaniel, FB Michael Robinson and OT Breno Giacomini. Seattle's offseason focus should be on offense. Seattle's pass protection struggled all season and Marshawn Lynch's yards per carry sagged because of the run blocking. Both guard spots and right tackle can be upgraded. The Seahawks should also be looking for pass catchers (receivers and tight ends) in the draft and free agency. The defense is loaded, but the Seahawks never have enough pass rushers. They also need depth at defensive tackle. » DE Red Bryant: The team's designation run-stuffer was released on the last day of February to escape a $3 million bonus in March. » WR Sidney Rice: Percy Harvin has essentially replaced Rice as the team's high-priced, injury-prone wideout. The 'Hawks officially released Rice in late February. » DE Chris Clemons: A monster Super Bowl performance capped a previously slow year for Clemons following ACL surgery. He's 32-years-old and his cap number is nearly $10 million, which is a lot for a rotational player (even a valuable one). » TE Zach Miller: He's a serviceable player paid like a star, with a $7 million cap figure. The Seahawks likely will approach Miller about a cut in pay, per Rapoport. If he refuses, he probably will be released. Rice and Bryant are goners. Miller and Clemons will probably only return if they take a reduced contract, which we could see happening. Expect Bennett and Tate to be re-signed, with Thurmond more likely to leave. Rapoport reported the team will prioritize Earl Thomas over Richard Sherman for a long-term deal. Look for a monster Thomas extension before the season. The Seahawks showed last year they aren't afraid to look for free-agent bargains; this is not a team or a coach that likes to stand pat.